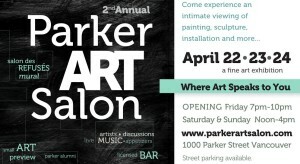 This weekend my studio building is hosting the 2nd annual Parker Art Salon, a fantastic art exhibition displayed along the labyrinth walls of 1000 Parker Street. This warehouse building is 98 years old & studio spaces of all sizes & shapes have been carved out over the years, so it’s a treat to see the doors open & take a peek at the creativity housed in every nook & cranny. 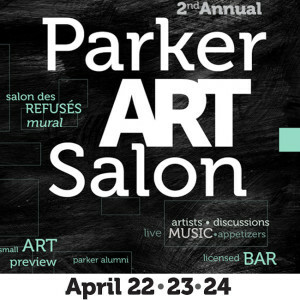 Unlike the Culture Crawl (in November), the Salon allows artists & guests to mingle throughout the hallways where each artist gets a 10 foot span to hang their work. At the Crawl, I tend to get stuck in the back of my studio because the building gets so packed with people, so I’ve been really loving the opportunity to see other artists’ work & get the time to chat with them – without feeling a pressing need to dash back to my studio!